Are windows a good investment? Without windows, your house would be a dark, grim cavelike space any time you turned off the lights—even in the middle of the day. Windows are an important part of your home that help turn a space that could be drab and dim into one that’s light and airy. They can be a problem though. Some window designs can transfer heat and cold between the outside and the inside of your house, which makes your house less energy efficient and thus more expensive. For many homeowners, a window upgrade can save money on their bills and make the house more attractive. Should you invest in new windows? If there’s been a mechanical failure in the window, you definitely need to replace it. In double-pane windows, if you can see clouding or condensation inside the panes, that means the seal is broken and the window needs replacing. Some houses may still have windows with only one pane of glass between the inside and the outside. These are prime candidates for replacement, especially if they have aluminum frames. Older windows are not well insulated and transfer energy easily between the inside and outside. In some cases the reason for an upgrade may just be cosmetic. But beware. If you only replace the windows in the front to make it more attractive, it may actually hurt you if you’re trying to sell the house. A few decades ago, if you’d smacked a baseball through a window, it would have been a simple fix to remove the trim, put in a new pane of glass, and redo the trim and caulking. That’s not the case any more. If you’ve ever looked at buying new windows, one thing becomes immediately apparent: new windows are not cheap. Most of the time, windows are part of a remodel when a homeowner has some cash earmarked for the project. Some contractors (including us) offer financing to allow you to do the whole house in one go. Occasionally the federal government runs a tax credit as well, which can help cut down the expenses. The total cost will vary greatly, of course, based on how many windows you’re replacing and the type of window you choose. What should I be aware of when looking for new windows? Low-emissivity (low-E) windows are a great investment. 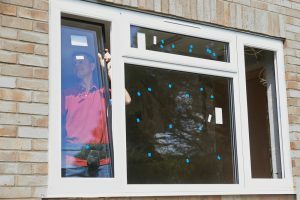 They incorporate a coating that helps reflect the heat of the sun, which makes your home even more energy efficient than regular double-glazed windows. Some window designs also incorporate helpful features that make them easier to clean, such as panes that tilt in. If you’re not sure whether or not to replace your windows, it’s best to check with a reputable contractor. A good contractor will take a look, ask you relevant questions, and then help you figure out a solution that fits your needs and budget. New windows will help your house look better and will save you money. If you’re thinking about replacing them, there’s no time like the present to see whether it’s feasible. Contact us and we’ll be happy to come give your home a look to see if a new set of windows would be right for you. Worried you may have storm or hail damage?